With the Atmos Adapter Converter, you can interchange nearly all Atmos vaporizer parts and assemble your own vape pens or combine custom parts from other brands to make mech mods. The converter has two sides. One side features the proprietary Atmos threading found on many Atmos brand vaporizer pens. This threading is unique to Atmos and not used by any other brands. The opposite side of the Atmos Adapter Converter features 510 threading. 510 threading is one of the most commonly used connectors in vaporizer pens and is found on many Atmos vape pens and vaporizer parts from other brands. Once you have connected the correct end of the Atmos Adapter Converter to your Atmos part, you can then connect a part with different threading to the other end. 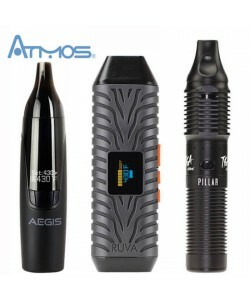 For example, you could connect the Atmos end to the Atmos threading on a heating chamber and the 510 threading to a 510 battery from Atmos or another brand.